Held on March 3 in the Ferst Center for the Arts, this year’s Margaret Guthman Musical Instrument Competition began with warm emotions from its namesake, as she shouted that Tech is the “best place to be in the world” to great audience applause. A few words were given in remembrance to her husband, Richard Guthman, IE ‘56, who founded the competition in her honor in 1998 before passing away in 2014. As John Biggs, east coast editor of TechCrunch and host for the evening, ascended the stage to introduce the competition, he promised an “amazing evening” of innovative music and technology; nine musician-engineer-artist finalists that took the stage — and their instruments — did not disappoint the audience. 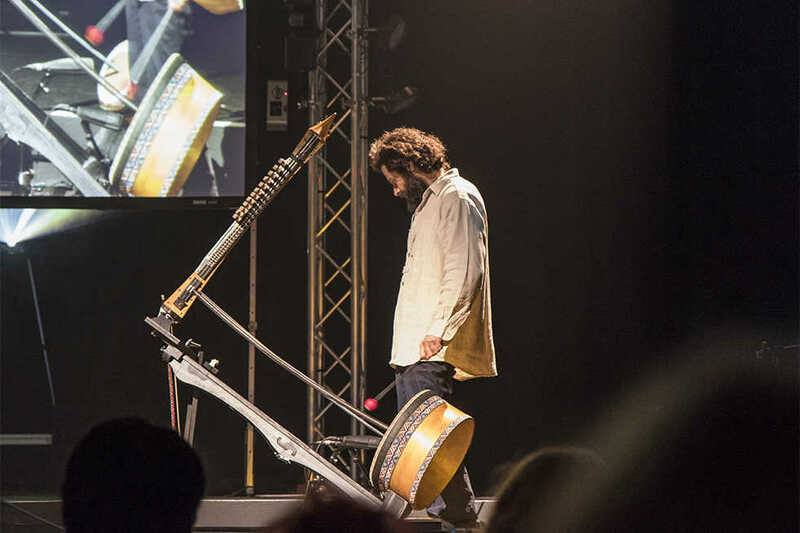 Pat Metheny, famed jazz guitarist, composer, and winner of twenty Grammy Awards; Allan Kozinn, critic, author, and professor at New York University; and Marcelo Wanderley, a professor of music technology at McGill University had the task of judging the performances and instruments. The audience was given a vote in three people’s choice awards: Most Unusual, Best Performance, and Best Instrument. The Golf Club Sitar was one of his many featured hybrid instruments. “[The Golf Club Sitar] expresses a poetic spirit of re-invention and hyper-utility,” Butler said. Other objects-turned-instruments he performed with included a shovel, an umbrella, a toothbrush, and even his own head. Greg Hendler, a current Master’s student in Tech’s Music Technology program, and Mark Crowley, a Tech alum with his Masters degree in Electrical Engineering, won last month’s Moog Hackathon, a competition held by Tech. Their first-place creation, dubbed the Big Eared Scrambler, won them a $3000 prize and automatic entry into the Guthman Competition. When asked their thoughts on the competition, both spoke with an eye toward next year’s Hackathon, which they intend to again compete in.